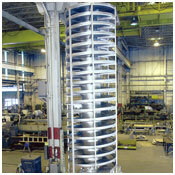 Spiral elevators provide extremely flexible processing of a range of materials. They are ideal for food and dairy products, and often eliminate the need for a dryer or cooler. Carrier spiral elevators are recognized throughout the industry for reliable performance and easy maintenance. Vibrating spiral elevators use the same principles of vibration that vibrating conveyors use to move materials. However, the spiral elevator has a trough that is helical in shape rather than a long, straight trough. Material is introduced via a feed spout at the bottom of the unit and moved upward as it conveys in circles around a centertube. Material is discharged from the spiral elevator at a height of up to 60 feet above the feed point. The Carrier spiral elevator is superior to other forms of elevators because it is very easy to clean and maintain. The unit handles a wide range of materials, from food and dairy products to sticky materials that adhere to non-vibrating surfaces. The primary advantage of the spiral elevator is that it can easily be designed to efficiently cool and dry materials using forced air or jacketed spiral flights. Because the spiral elevator is so flexible, users can oftentimes eliminate a dryer or cooler and accomplish all of their processing requirements on the elevator. 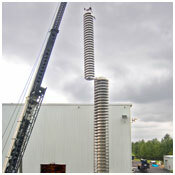 More on our vibrating spiral elevators.